We recently held yet another successful national networking and information sharing day for staff working in abdominal aortic aneurysm (AAA) screening. The event brought together more than 100 delegates from local providers, commissioners and the screening quality assurance service (SQAS). National programme manager Lisa Summers gave an update on the programme. Since its launch, it has invited 2 million men for screening, screened 1.5 million men and referred 5,000 men with large aneurysms for treatment. Matt Bown, professor of vascular surgery at the University of Leicester, talked about a research proposal looking at combining screening for peripheral arterial disease (PAD) to the AAA programme to see if this would improve men’s health. If the results from a small scale study show it is possible to combine PAD screening and AAA screening, the next step would be to carry out a randomised controlled trial. You can email Matt at m.bown@le.ac.uk if you would like to know more about this research proposal or would like to help. National research lead Gerry Stansby, Professor of Vascular Surgery at the University of Newcastle and the Freeman Hospital, explained how the committee considers proposals for research, evaluation and audit using AAA screening data. National clinical lead Jonothan Earnshaw updated us on a research project looking at the possible impact on quality of life of having an aneurysm detected by screening and then being invited for regular surveillance scans. The national programme is working on this project with the University of Sheffield School of Health and Related Research and will have a detailed plan in place soon. He also spoke about an optimisation project looking at whether screening intervals for men under surveillance should be changed. John Carlisle, a consultant anaesthetist at Torbay Hospital, described a computer model he has created to help decide when men should be offered AA repair. His model takes into account national data on survival for men in each age bracket and the general fitness of the individuals. National advisory board chair Meryl Davis gave an update on the work of the board which involves users and stakeholders and considers any proposed changes to how AAA screening is delivered. She asked if any clinical skills trainers (CSTs), screening technicians or screening and immunisation leads would be interested in becoming board members. SQAS supports local providers with quality improvement activities. Four local providers shared examples of activities that have reduced barriers and improved uptake. You can submit an example of best practice if you have a case study that you would like to share with other local providers. I gave an update on education and training in the AAA screening programme. Assessors for the level 3 health screener diploma evaluate and guide learners in their workplace. Assessors must hold, or be working towards a formal assessor qualification. We have commissioned Skills for Health to produce a video resource to help assessors and learners who are undertaking the diploma and hope to have it ready by December 2018. We will let you know when it is available. We will also be running half-day regional workshops for assessors, so keep an eye on the blog for the workshop dates. 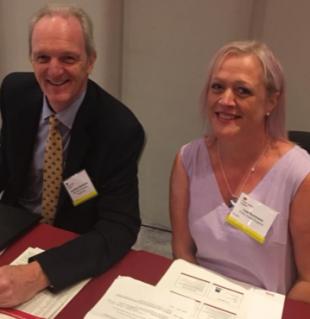 Next year’s annual networking and information sharing day will take place in Birmingham on 24 June 2019. Thank you to everyone who was able to join us this year. Your contribution helps to continually improve AAA screening in England. A well organised and informative day. Sadly it is possibly the last occasion that Jonothan Earnshaw will be attending as national clinical lead for the NAAASP. Thank you Jonothan for the many years of your leadership and sound knowledge. We will miss you!